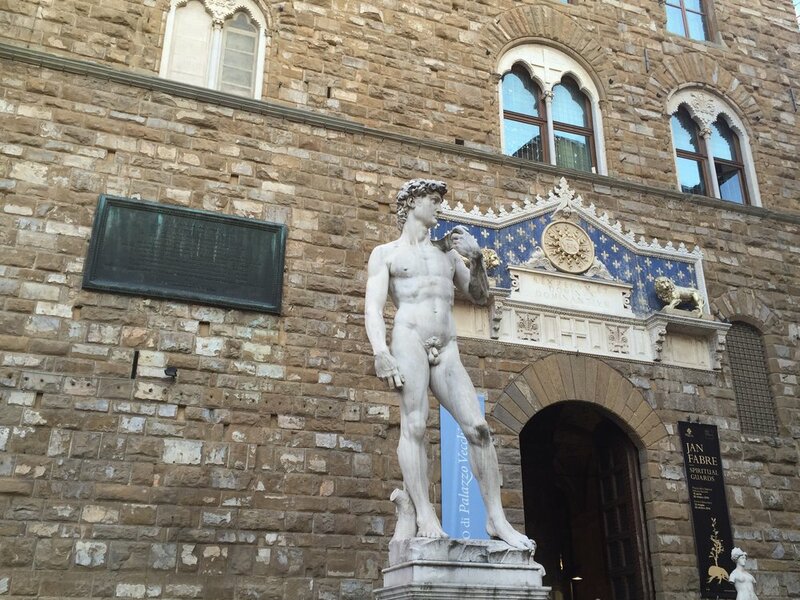 After an incredible weekend in Munich, we were back in Florence for another 4 days of school. My homemade film camera worked! We finished putting it together during class, and went on the school's roof to shoot our photos. I'm so excited to see everyone's photos once we print them next week. I'm working hard to improve my Italian as quickly as possible here. 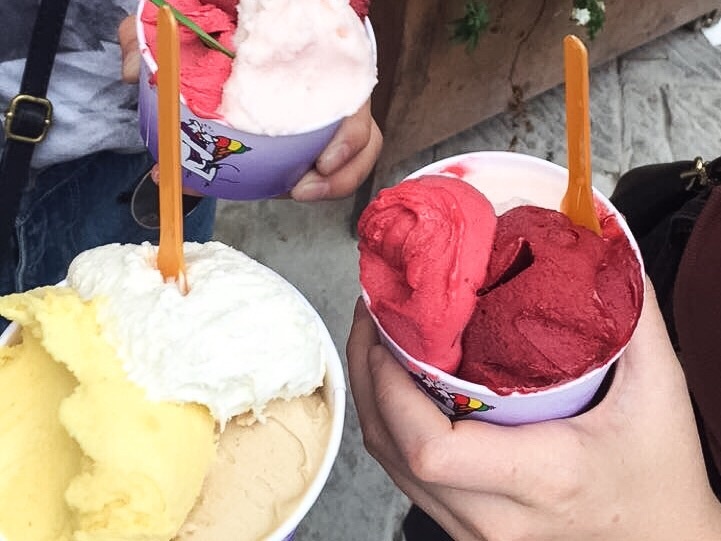 On Wednesday, we took a field trip to one of my favorite gelato spots to practice ordering food in Italian. I couldn't complain; it was my 4th day in a row getting gelato. Industrial design studio is very different from studio at CMU. The projects are extremely open, and it isn't really a "studio". The final product here will always be a photographic rendering of our idea. While there will be sketch modeling along the way, this is a big change from actually building my product in the wood shop. Regardless of the differences, I really enjoy this class. Almost everybody is Italian, which gives me a chance to get away from Americans and feel more immersed. The professor is great, as I've mentioned before. This week I had a chance to have a 20 minute meeting with her to share my project ideas. She gave me some great pointers, and let me on my way. I look forward to seeing the result of creating my own project briefs. My roommate and I had a wonderful Friday, our day off from both school and traveling. We both had to run errands on opposite sides of the city, but we ended up having a much longer excursion and walking about 7.5 miles. We went to the Mercado Centrale and dug through the nearly hundred stands of leather, checked out some lovely Italian boutiques, and topped it off with freshly squeezed juice. Later, we went out for a delicious dinner of pasta, wine, and gelato (what else do you eat here?) with a couple of other friends. It was a nice relaxing day before a very long weekend. Saturday morning, we were up at 7 to go meet up with our school for a day trip to Siena and San Gimignano. Despite an unusually cold bus ride, the day was lovely. 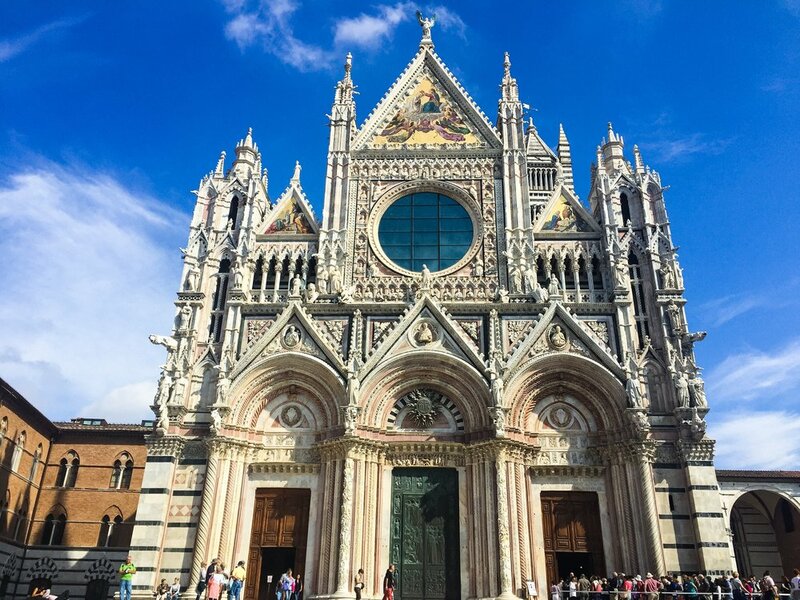 In Siena, we had a guided city tour, including a visit to the incredible cathedral, followed by some free time to explore and have lunch. We tried out a Siena specialty called pici, a thick hand-rolled pasta, and of course, some more Tuscan wine. After a few hours, we left for San Gimignano, a small walled medieval town, and personally my favorite over Siena. The moment we arrived, we had a beautiful view of the vineyards and fell in love. Unfortunately, we weren't given as much time here, but we took full advantage of what we did have and stood in line for a world champion gelateria. I'm not sure if it's the world's best, but it was definitely tasty and unique. Some of their flavors included rosemary, pine nut, and black olive. While I wasn't too adventurous, my choices were still delicious; I got nocciola (hazelnut- aka my favorite gelato flavor), white chocolate, and passion fruit. What made the experience even sweeter was that we got 5 cups with 3 flavors each for free! On our way into the center of the city, one of my roommates noticed a man had dropped some money as he was leaving. We yelled to get his attention, and when he realized what happened, he told us to keep the 20 euros. And that's how a kind man paid for our 7th gelato of the week- our first perfect streak! We returned to Florence around 6:30, content and exhausted. I took some time to relax and hangout on my roof as usual. Sunday morning we woke up even earlier, this time at 5:45, and got ready to leave for a day trip to Cinque Terre, a string of 5 seaside villages along the Italian coastline. This time, just my roommate and neighbor went using a bus tour company. 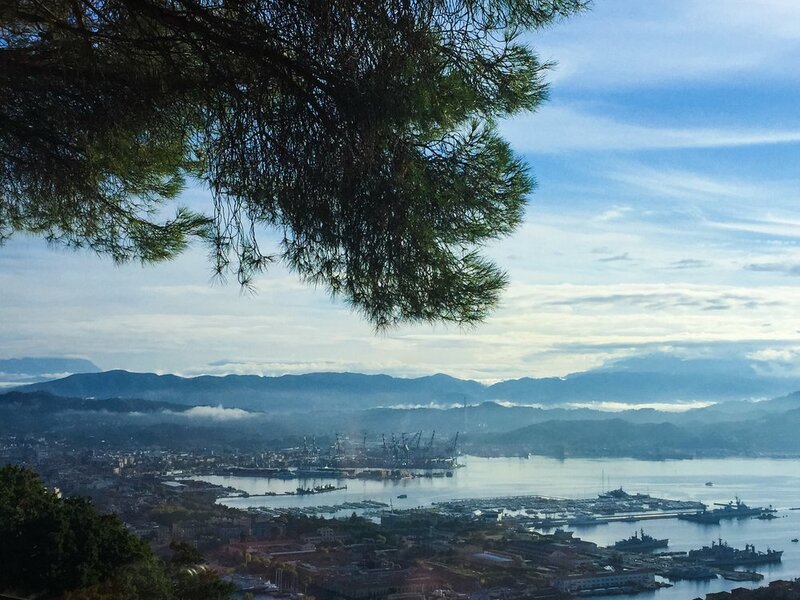 After boarding the bus, we fell right asleep and woke up around 9:30 to yet another breathtaking view. 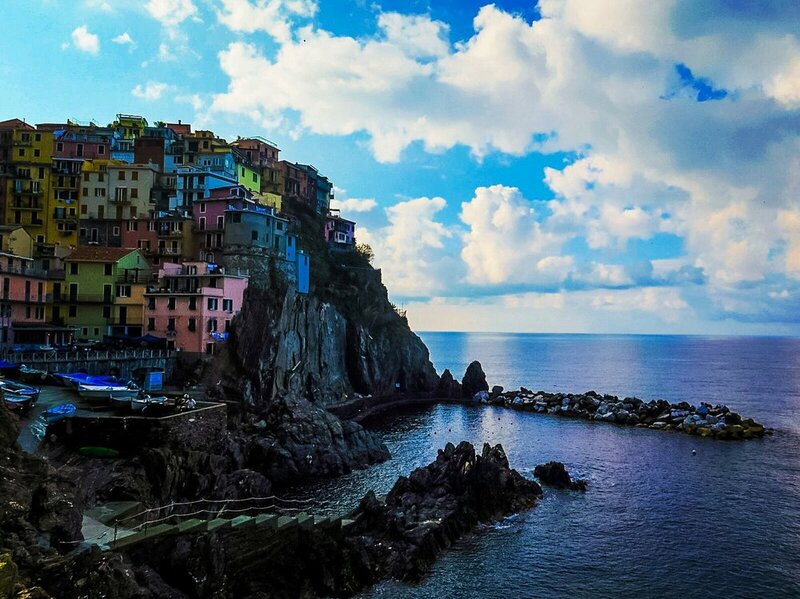 We began with Manarola, a village that had a perfect view of Cinque Terre's iconic colorful houses. Next we took a quick train to Riomaggiore where we indulged in their specialty, pesto pizza. Finally, we took one more train to Monterosso, our last stop of the day. Since we had limited time, we weren't able to visit all 5 villages. We couldn't complain though. 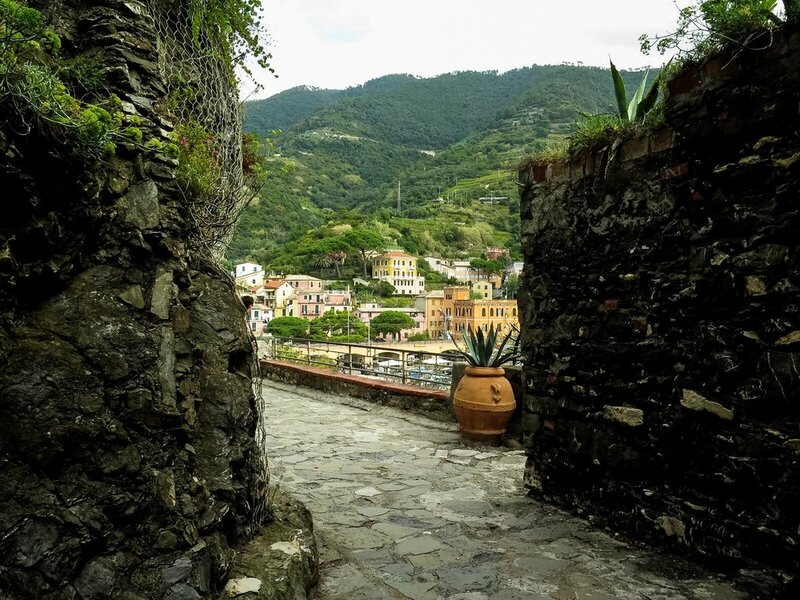 We had about 4 hours to ourselves in Monterosso, and I think we spent them perfectly. We walked around the old town taking photos, grabbed some fresh strawberry daquiris, and headed to the beach. Though the morning was a bit gloomy, the sun came out and made for the perfect beach weather. We enjoyed our drinks, got massages right on our towels, and of course, dove into the unbelievably clear water. Later, as we were getting ready to leave, our masseuse came over and offered to take our photo, which turned out better than anything I could ever expect from someone we hardly knew. We boarded the bus and were home for dinner. After what felt like 5 days of traveling, it was time to start our homework! I'm not quite sure how I'll be able to return to CMU, but I try not to worry about that too much for now.